The metrosexual man of today does not mind spending hours in front of the mirror, making weekly trips to the spa or splurging on cosmetics and accessories to enhance his looks. In fact, he doesn’t mind doing anything that was, till some years ago, considered “girly”, if it is meant to pump up his style quotient. So, it does not come as a surprise to find more and more men in jewellery shops today, buying the glittering metal for themselves rather than purchasing it for their partner. We have seen the uber cool UB Group chief Vijay Mallya and the renowned musician Bappi Lahiri being trendsetters with their fetish for gold, but what has gone into the youth in the country in this regard is a bit inexplicable. Helping us to sort out this change is Mr Vinod Hayagriv, Managing Director, Jeweller C Krishniah Chetty & Sons, whose workstation is a vantage point for the goings on at his diamond boutique in Bangalore. “Men are probably much more comfortable participating in jewellery shopping now than ever before,” Hayagriv says with a certain sense of justification to the fact. Fancy bracelets, rings, studs and chains are fast becoming part of the fashion statement of India’s fashion conscious men, who have already added cosmetics and fairness creams to their daily routine. Kolkata-based Shree Ganesh Jewellery House has recently rolled out a men’s jewellery range under the brand name Gaja. 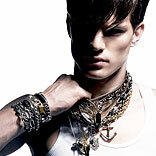 Research shows that the demand for men’s jewellery is higher in the metropolitan cities of India. Men from the metros are quick to adapt to the change in trends and prefer buying jewellery that is lightweight, yet chunky and bold. The fact that India has overtaken the US to become the third-largest men’s luxury jewellery market in the world this year, according to researcher Euromonitor International, is not surprising. The researcher estimates the country’s men's jewellery market at $194.4 million or around Rs 954 crore in sales and it is projected to grow by 36.4 per cent next year. The figure may look insignificant in the more than Rs 1.2 lakh crore Indian jewellery market dominated by women buyers, but more and more jewellers are paying attention to this growing set of consumers. GRT Jewellers pegs the share of men’s jewellery in its total sales at 20-25 per cent whereas Orra, a national diamond jewellery chain with a presence in 23 cities, attains six per cent of its sales from men’s jewellery. “With the advent of the metrosexual revolution, men have become conscious of their personality and started using jewellery to enhance their image. But it was only in the recent past that men came out in the open about their liking for chunky jewellery. Jewellery companies in India have realized this trend and have started making designs to cater to this market,” says Mr Niyat Parekh, CEO, Diya Diamonds Jewellery. Research indicates that 15- 20 per cent of all platinum jewellery purchases are made by men. It was around 5–8 per cent three years ago as per industry body Platinum Guild International. For top diamond jeweler, Gitanjali Group, men account for almost 42 per cent of its sales. The average purchase value of these consumers has also doubled to 25,000 in two years’ time. Forecasters predict that the sale of men's jewellery will be double the sale of women's high-end jewellery in the near future. It seems rings and bracelets have become top-selling jewellery for men. Diya from the Gitanjali Group has a collection called Param that presents various attractive designs in cufflinks and rings that can fulfil the customer’s dream of owning a piece of diamond jewellery. The designers, in a bid to in keep with this latest trend, are doing their best to catch the front-runners in this segment. “Men today want to look trendy, which is why designers are coming up with new designs and a wide variety of men's jewellery pieces that are available in the market in both light and heavy designs,” says Mr. Sulish Verma, Designer, Vikas Chain & Jewellery. Industry experts believe that the male affinity for jewellery will propel India into the third spot, behind China and the United Kingdom, which ought to prompt more and more jewellery brands from across the globe to venture into the country.